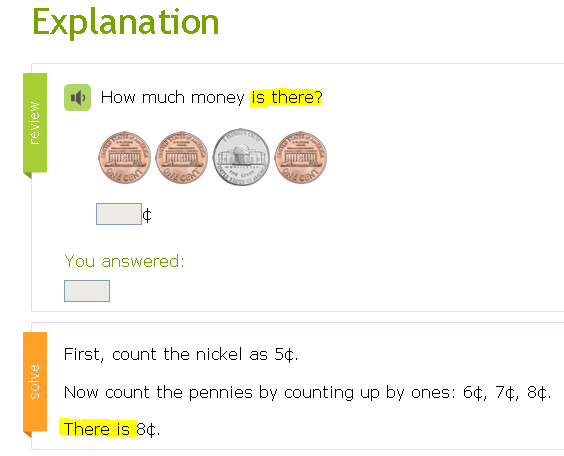 I'm using a website - www.ixl.com - to teach my child how to count American coins, amongst other activities. The site also has many questions on English grammar. One thing that doesn't seem right - and perhaps I'm missing something here - is their conjugation of the response to "How much money is there?" I've never encountered the question where there's only a single penny (1¢) displayed. Thus there are always several cents. I would have thought that the answer should be conjugated with the plural conjugation. Is the correct answer to "How much money is there?" (in the case of the three 1¢ coins and the 5¢ coin shown in the image) "There are eight cents."? Or am I missing something? EDITED: There might be a previous question on this site whose answer would be applicable to this OP's question, but neither of those two threads cited to mark this OP's thread as a "duplicate" has an answer for the OP's question: the 1st "duplicate" thread discusses "A total of X" and its number when it is a subject, the 2nd thread involves a possible subject-dependent inversion with a measurement phrase with a sentence beginning with "Here". This OP's specific question deals with numerous topics, and its sentence also involves a leading "There", which ends up making the issue even more involved. Please get the duplicate mark off this thread so I can give the OP an answer. -- F.E. I'm not American but I think you can find both: "There are eight cents" and "There is (a total/an amount of) eight cents". Q: How much time is there before the New Year? A: There is exactly two minutes and thirty-five seconds (before the New Year). Q: How many football players are there in the bus? A: There are exactly thirty-five (football players in the bus). Not the answer you're looking for? Browse other questions tagged grammatical-number uncountable-nouns there-is countable-nouns or ask your own question. “My last couple of years” — singular or plural? Is “none” singular or plural? How can I decide? How to choose verb after “there” in beginning of sentence? Should I say “metal” or “metals” when I'm talking about multiple units of the same type of metal?